Lately, Mexico has been in the news because of the violent drug wars. But there is another war going on south of the border not getting the same attention, and that is the war on food. IPS News recently did this great video on Mexico's food security problem. In the 16 years since NAFTA has been in effect, have the lives of Mexicans and Americans really improved? Mexico: Food Emergency from IPS Inter Press Service on Vimeo. Global food giant Nestlé has been under a critical spotlight for alleged poor corporate and social practices for many years. Recently, activists have accused the company of several problems, including only one percent of Nestlé cocoa products are FairTrade certified, continued child slavery in the cocoa supply chain, and its baby milk products not meeting international standards. The latest accusation of Nestlé's bad practices is now being seen loud and clear through a viral video, which is another great example of digital activism. Greenpeace UK uploaded a video on Youtube, showing an office worker opening a Kit Kat and finding an orangutan's finger. Nestlé, which produces the popular chocolate bar, is being blamed by the green justice group of buying palm oil, which is used in many of its products, from Indonesian producer Sinar Mar. As a result, Greenpeace claims that this partnership has resulted in destroyed rainforests where Indonesia's last orangutans live and has created a devastating carbon footprint. In the last 50 years, an area more than twice the size of Germany has been logged, burned or otherwise degraded, with palm oil plantations being a major cause, according to Greenpeace. On Wednesday, Nestlé released a statement denying it buys palm oil from Sinar Mar for any of its products, including Kit Kats. "We do purchase palm oil from Cargill and we have sought assurances from them about their supply chain," it said. "Cargill has informed us that Sinar Mas needs to answer Greenpeace's allegations by the end of April. They have indicated that they will de-list Sinar Mas if they do not take corrective action by then. "Nestlé recently undertook a detailed review of its supply chain to establish the source of its palm oil supplies and we have made a commitment to using only 'Certified Sustainable Palm Oil' by 2015, when sufficient quantities should be available." Greenpeace claims that Nestlé asked YouTube to remove the video citing copyright concerns. Specifically Nestlé was bothered by the twist on the Kit Kat's famous slogan used at the end of the video: "Have a break? Give orangutans a break." However, the video was reposted the next day. Greenpeace said the video being taken down was a censorship attempt, which was "a pretext for stopping the word being spread and an apparent attempt to silence us." Elsewhere online, approximately 90,000 Nestle protesters have taken over the company's Facebook page, to make their grievances clear, creating possibly one of the largest digital protests since last summer's Iranian election protests. In the long run, the Nestle debacle might show other companies how not to deal with online crisis communications. While Greenpeace created a very effective and (very graphic) video, the question always remains: Will digital activists take their protests offline and actually stop eating Kit Kats in the long term? Only time will tell. I just read a fascinating article that just about sums up everything that is wrong with globalization. Guardian environmental editor John Vidal recently wrote about how multinational companies, governments and rich individuals are acquiring every piece of available (and unavailable) land in Africa for their own food and biofuel production. The land rush, which is still accelerating, has been triggered by the worldwide food shortages which followed the sharp oil price rises in 2008, growing water shortages and the European Union's insistence that 10% of all transport fuel must come from plant-based biofuels by 2015. In many areas the deals have led to evictions, civil unrest and complaints of "land grabbing." This article uses the example of the Ethiopian born, Saudi businessman Sheikh Mohammed al-Amoudi buying up land in his impoverished homeland, but here is the kicker. Ethiopia is one of the hungriest countries in the world with more than 13 million people needing food aid, but paradoxically the government is offering at least 3m hectares of its most fertile land to rich countries and some of the world's most wealthy individuals to export food for their own populations. 1. Sure, it is good to give jobs to poor people, but are they getting good jobs? Decent wage? What about worker exploitation? 2. Why isn't any of the food being produce in Africa not being resold in Africa? 4. Isn't anyone worried about the already sensitive problem of food security in Africa? With more biofuel production comes less food for Africans (and the rest of the world). 5. The environmental impact goes beyond water intensive farming. What about the carbon impact of flying food from Africa to another continent? 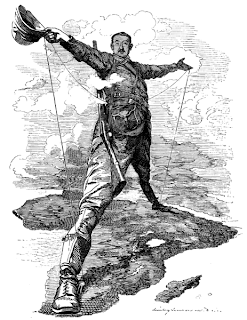 6.The new land grab doesn't look any different from the original Scramble for Africa? According to the Joint United Nations Programme on HIV/AIDS (UNAIDS), over 33 million people worldwide are living with HIV. In the United States most aid for preventing and treating the virus tends to go towards those living in the developing world. However, there has been criticism by many American advocates that the U.S. government has neglected to provide the same aid to a group in its own country which has been the most affected by the virus - African Americans. While African Americans represent over 12 percent of the U.S. population, they account for over half of all those being infected yearly and living in the United States with HIV. As the Obama administration starts to put together a national HIV/AIDS strategy - the first one in 20 years, other HIV activists are taking their message directly to the people via digital activism. The "i know" effort is part of the Centers for Disease Control and Prevention's Act Against AIDS campaign, which uses multiple social media platforms to reach out to African American youth with facts about HIV/AIDS with the aim to engage them in open conversation. "By supporting frank conversations through social media, 'i know' creates an opportunity for young people to talk directly with each other about the issues that fuel this still-deadly disease," said Kevin Fenton, director of CDC's National Center for HIV/AIDS, Viral Hepatitis, STD and TB Prevention. "Their ideas and involvement will be a critical part of the solution." The campaign uses a mix of both old and new media. Followers have a choice of using Twitter, Facebook and texting to get alerts and status updates on HIV knowledge and attitudes, as well as links to information about HIV testing and prevention. The campaign's website allows users to identify local HIV testing sites and campaign events and video stories of those living with HIV. There are also radio and online video public service announcements that has actor Jamie Foxx calling for a new discussion on HIV. Since the campaign's launch on March 4, hundreds of users have become followers of the various platforms and it seems that the campaign has initially succeeded in engaging users, as can be seen with the many status re-tweets and discussion. While it is good that social media is being used in this campaign, it should also be highlighted that the campaign's radio use is just as important, as many African-Americans still see the significance of this medium for getting out information within their community. However, it will take a longer amount of time to actually determine if both the online and radio efforts turn into offline actions. Whether it is a new home or a television, having good insurance is a pretty important thing to have to maintain a sound mind and prevent future problems for the many investments in our lives. So, it is no surprise that farmland should also be given the same consideration for insurance. A new protection policy in Africa is using technology to insure some of the world's most vulnerable farmers. Last year's droughts throughout Africa were some of the worst in decades, causing higher food prices, illness among both people and animals and destroyed crops that took months to repair. To address these problems, the Agricultural Index Insurance Initiative at the Syngenta Foundation launched last week Kilimo Salama, Swahili for "safe farming", to provide insurance plans for Kenyan farmers. Here is how it works: When purchasing seeds from an retailer, farmers register to insure their seeds by filling in the insurance card. 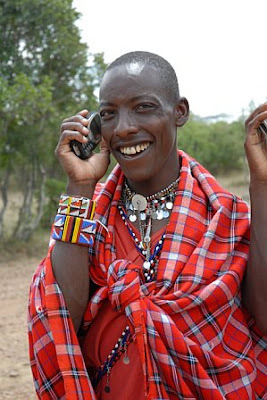 The registration process is completed when the farmer sends a text message on their mobile phone, and a record is created in a database. A local weather station records the rainfall and sends the data to the insurance company, which then calculates a payout according to an agronomic model. At the end of the season the farmer receives a text message if there is a payout and can pick up their payout at the original retailer where the insurance was purchased. Kilimo Salama actually began as a small pilot project last year with a group of 200 farmers in the central region of Laikipia. Most of the farmers were highly impressed with the program, as many of them received a payout of up to 80 percent. This year the insurance program will cover at least 5,000 maize and wheat farmers in Central, Rift Valley and Western provinces, which is at high risk of drought. This program shows that even a simple tool like a mobile phone can make a big difference in the lives of many.